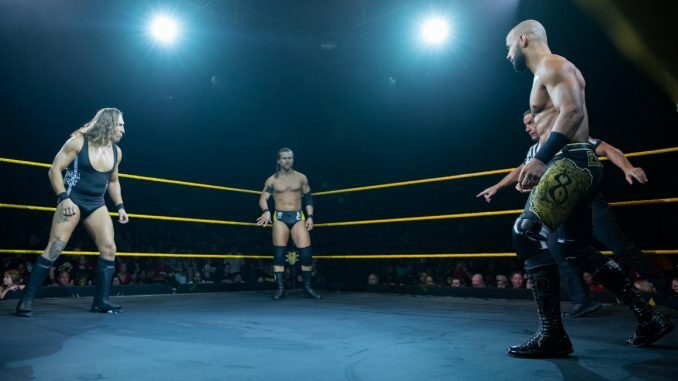 John Pollock reviews this week's edition of NXT featuring an excellent main event with Ricochet defending the NXT North American title against Pete Dunne and Adam Cole. -The three-way main event for the North American title was outstanding and another candidate for best WWE match this year. It was very close in quality to the Ricochet and Pete Dunne match from last month, I felt that match was slightly above this one, but the downside was the non-finish to last month’s match and this had a decisive winner in Ricochet. -Some of the big moments of the match included Ricochet executing a double top rope Frankensteiner to both and then attempted a reverse ‘rana to Dunne. Dunne hit the Bitter End to Cole and then Ricochet came off the top with a shooting star press and landed in a triangle by Dunne. Dunne turned it into an Inverted triangle and snapped Ricochet’s fingers before Cole superkicked Dunne to break the submission. Then, with Ricochet selling the submission and finger snap, he was hit with the Last Shot by Cole, who then hit the Ushigoroshi to Dunne, but Ricochet saved. -The finish featured Dunne hitting Cole with the Bitter End, but the pinfall was broken by Ricochet’s springboard 450 splash onto Dunne and pinned him. This was excellent and on par with the three-way from King of Pro Wrestling this past Monday as two of the better versions of the match, you will see. -In a backstage segment, Kassius Ohno confronted William Regal and brought up Regal’s “Bromance” with a new competitor. They are heavily teasing Ohno being Matt Riddle’s first opponent at TakeOver, which should be great. Ohno was wearing a Yoshihiro Takayama t-shirt, which wasn’t the only reference to Takayama as Mauro Ranallo cited Takayama and Don Frye during a striking exchange in the three-way match. -Nikki Cross was really entertaining in the segments she was part of. She interrupted an interview segment with Tommaso Ciampa and Velveteen Dream and has the crazy act down pat. It may get grating over time, but I think she’s found the rhythm to the character. The story is that Cross is crazy, but she knows the secret attacker of Aleister Black. -Keith Lee beat Kona Reeves in a quick match where Lee sold for a portion of the match, came back with a pounce and the jackhammer finish, which is called the Super Nova. -The main event alone made this a “thumbs up” show and the rest of the show was uneventful. Next week’s show will feature an NXT tag title match with Kyle O’Reilly & Roderick Strong vs. War Raiders and a rematch between Nikki Cross and Bianca Belair.